At Gotham Ventures we have a number of interns each year, and I often find myself explaining to them the mental models I use to understand the world of venture. 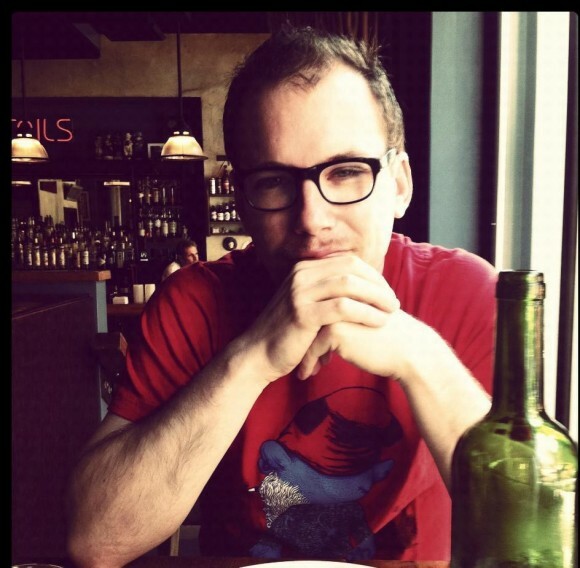 I thought it might be useful to others to hear some of these thoughts, what follows is my mental model of deal flow strategies. In the world of venture there are a few different methods for finding great investments. 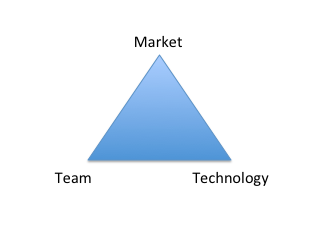 There are three basic things that firms tend to focus on: Technology, Market, and Team. And different people and firms tend to try to optimize around those. I tend to think of it as a triangle where a perfect company might be dead in the center but most tend to be stronger in one area and weaker in the others. While everyone wants a company that is perfect in all three of these areas, that is a rarity so historically some firms are known to gravitate towards companies with more strength in one area or another. For instance, Kleiner Perkins is known to like companies with strong technology whereas Sequioa has often said that market size is king. Of course both firms would say that the team is also incredibly important, but they are willing to give up a little on the team for strength in another area. The average person moves jobs once every 4 years so 25 of the 100 will be moving on any given year. Of those people, maybe 10 will go to startups, and of those maybe 1 will be really interesting. And that’s all he needed, 1 good deal a year. This was clearly a gross simplification of what he did, but at the time I was a coder who knew nothing of the valley and so this was probably an appropriate level of depth. The real key to this line of thinking is simple, have a small but very high quality pool from which to draw deals. Now let’s contrast this with Dave McClure’s approach to investing. Instead of having 100 people who call him first, Dave casts a very wide net. He is going to invest in 500 companies a year, so he needs a lot more than 100 people bringing him deals. He wants to see everything. Dave can argue that by seeing a huge number of deals he will have a better understanding of what is going on in the market than someone with a more limited scope, and therefore he will be better able to compare. It should also be noted that these strategies are at different stages of the funding game, Dave is investing at the Seed stage while David was investing in Series A and B. However, I think there are plenty of Seed investors who follow David’s basic model today. Another deal flow strategy that people have tried is to have a ‘captive market’. For instance, firms that are geographically focused in tech hubs where they are the only player, or firms that have partnered with a school. The partners at Borealis Ventures have executed on this type of strategy to great effect. They are located in Hanover NH, right next to Dartmouth College and a couple hours drive from Boston. By working closely with the college they have found great companies such as Glycofi and Adimab as they spun out technology from Dartmouth. This has led to some really big wins and great returns for the firm. My final thoughts are on people who specialize in a certain area. By being or becoming experts in a field they then can become the “go-to” investor for that community. I tend to think of specialization as a more focused case of the first network strategy, but instead of narrowing your field by your network you go and create a new network to work with. Having said that, specialization is clearly a method that has worked for many investors and even some firms.